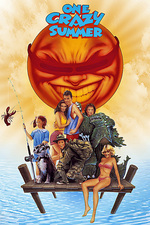 Writer-director Savage Steve Holland and star John Cusack immediately followed up their cult hit Better Off Dead... with this Nantucket-set wacky-fest, bringing along Demi Moore, Bobcat Goldthwait, and fellow Better Off Deader Curtis Armstrong. This was such a strange movie with a few scenes that felt like they should have been part of a much better movie. Actually, a lot of it was Goldthwait's performance, especially in that Godzilla suit. I hadn't seen this since high school, and boy did it not hold up, especially compared to Better Off Dead. I think it was an attempt at more of an ensemble, giving most of the minor characters something more to do than just being there to back up the Cusack character, but it ended up feeling like a lot of loose story threads drawing attention from each other and making the thing as a whole suffer as a result. For example, I'm sure you're actually supposed to feel something for Curtis Armstrong not living up to his dad's standards but then finally winning his dad's approval...But that storyline is given maybe five minutes of screentime, total throughout the movie. But as capricorn said, there were still some laugh out loud moments. Demi's "I know Dow" thing was great, and yeah, Bobcat brought it. I hate it when movies/TV shows spend all this time establishing the air of wackiness about the whole thing and then have a character like Demi Moore whom we're supposed to take seriously as being tough-but-sensitive. In any other movie she'd still be trying too hard, but in this one she breaks up what could be purely stupid fun. Blecch. This was such a strange movie with a few scenes that felt like they should have been part of a much better movie. I think it was an attempt at more of an ensemble, giving most of the minor characters something more to do than just being there to back up the Cusack character, but it ended up feeling like a lot of loose story threads drawing attention from each other and making the thing as a whole suffer as a result. This was the first movie I remember thinking of as a "sketch" movie -- not as thematically tight as an ensemble movie, but not as focused as (to use another early Cusack film) The Sure Thing. There are plenty of more literal sketch movies (e.g., Kentucky Fried Movie, Four Rooms), but this one is much better if approached as a looser collection of sketches than an ensemble movie. A friend in high school grew up outside of Boston so this became his favorite movie ever (being set in Nantucket, where his family would vacation), and it became mine too. I think I've seen it 100 times already, but I'll watch it again to see how it holds up. It's definitely a weird movie, with wild tonal shifts. It starts out almost like Airplane! with dumb jokes all over the place, but then they lose momentum on that front and all of a sudden we're supposed to be rooting for these guys to win a sailboat race that will somehow keep the evil family from buying a nursing home or something? I was never really that clear on how exactly how the boat race mattered, and the movie barely cared enough about Demi Moore's house to show it even once. That whole Godzilla sequence was really great, though, and the sailing bit was entertaining even without the stakes being that clear. I just watched this movie again for the first time in probably 20 years. I guess it was ok, but it is basically a throwaway film. There is no heart behind it, really. I mean I have a man crush on John Cusack and everything he does, so there is that, but on the flipside I think that Bobcat is probably the least interesting actor that has ever walked the face of the earth. Sure the Godzilla bit was funny, but that had nothing to do with Bobcat himself. I would actually be surprised if he was the one in the suit the whole time. I do kind of wonder about the engineering feat it would take to put the back end of a Ferrari into a sailboat, though. "I'm doodling with Bobcat Goldthwait on a semi-sequel to One Crazy Summer," he says. "Our lives are just really different but I still love him and we say we gotta do this thing. So we are working on One Epic Fall. Of course, Joel [Murray] is gonna be in it. The question is, how do we make it a sequel when Cusack's not gonna be in it? But we have so many bad, dumb, great jokes we're piecing together to see if we can pull it off. I don't think Demi would be on board, but with Joel, Bobcat and Curtis, you've already got a trifecta of genius there."